What is the one tool you always need around a house, but you never know where to store it? Answer: It’s long, usually mounted on a garage wall when stored. You guessed it: A Ladder. It is amazing that so few people have telescopic ladders these days. What can be better than something that pulls out when you need length or height and collapses to carry and store away. Sure there are times when you need a double-leaf 30-foot ladder to reach high gutters for example. But most projects can be done with a reach of 12-14 foot ladders. So-called combination ladders are particularly useful. They look like an A- frame. They are designed to provide proper support on uneven surfaces such as steps, for instance. 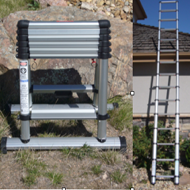 Before buying another conventional ladder check out Telesteps. You will love how much space it saves in your garage or storage shed. Unfortunately, Telesteps ladders are a bit difficult to find. Their website is poorly organized, slow and does not offer distributor information. Telesteps appears to be a company with a great product but poor marketing. There is one feature I would like to see added to Telesteps ladders: pivoting feet. When in use ladders are on angles which means a straight base will only partially connect the ladder to the ground. This is particularly important on hard surfaces like stone or asphalt. The addition of pivoting feet would create a much better connection to the ground. While their website shows soft rubber feet for “interior surfaces” the single rod that connects these rubber feet to the main ladder simply do not look substantial/supportive. Naturally, always use caution when using a ladder. Ladders should be handled properly by people who know what they are doing.